Artwork Panel: 50.4cm x 95.9cm ≈ 19¾" x 37¾"
Silk/Brocade: 59.2cm x 152.9cm ≈ 23¼" x 60¼"
Width at Wooden Knobs: 68.2cm ≈ 26¾"
This depicts the famous warrior saint, Guan Gong. The title of this piece translates as, "Loyalty and Righteousness Amoung the Brave," or "Loyalty and Devotion of the Courageous." The rest of the Chinese characters indicate when this was painted (2011) and the artist's signature. The artist's name is (Wang Wen-Hua) who lives in the Jinan area of Shandong Province in Northern China. He specializes in traditional figure paintings and subjects like this (especially Buddhism and philosophy-related themes). 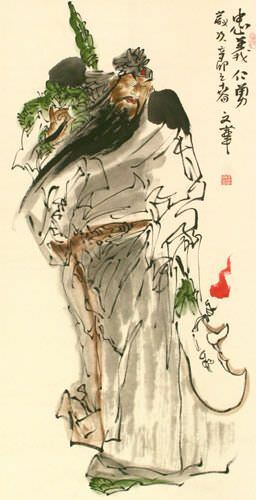 This was painted on Chinese xuan paper (often incorrectly called "rice paper"). The artist used watercolors throughout. A Typical art-buying trip lasts for 6 weeks, and covers at least 4000 miles across China. Most of these miles are covered by train. It's not a bad way to go considering that you can go half-way across China for less than $100. On the downside, you can expect to spend about 30 hours straight on that cross-country train. When I get back to Beijing, I am always exhausted, but happy that the art I bought for my customers has safely arrived as well. 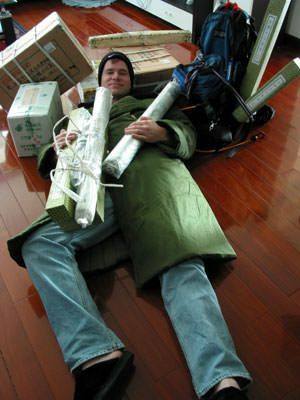 When I started buying art to sell on the internet, I tried to carry it all back with me. But these days, I buy too much art to do that anymore. Last year I started to ship art back to Beijing as I traveled from city to city, and village to village. Occasionally, I use "train freight", but usually, I stick with "China Post" (The Chinese Postal Service). Sometimes I worry if the precious artwork will get to Beijing safely, but so far, I have not lost a single package, and the Chinese postal system, while complicated, and full of red-tape, is very reliable. Because the art I buy is just on raw xuan paper (rice paper), it can be rolled up or folded and packed in boxes without damaging it. Once the artwork arrives in Beijing, my business partner, Sandy, and I sort though the art and send a selection of it to be mounted. In the mounted process, the artwork is flattened out and laminated to several more sheets of rice paper to make it thicker, yet pliable. If the artwork is going to be a portrait, a nice silk border is added around the edges of the painting. If we tell the mounter to build a scroll, the process is similar, but with a lot more silk with the addition of a wooden frame and ribbon at the top so that you can hang your scroll, and a scroll roller at the bottom. The mounted portraits and scrolls take up a lot of space. If I mounted everything that I brought back from a trip at one time, it would probably fill half of a room. So we meter out the artwork to the mounter's studio little by little as we need it, and as we have room on our shelves. Once we get a new batch of art, Sandy or I go to work taking tons of pictures in our little photo studio. It takes a full day to take 50 new art pictures, adjust them to the right size for our website, and upload the images to our server. After that, I spend hours, usually with my wife, Cat, to work on translating the titles of the paintings, writing the artists' stories, and maybe writing up an adventure about how I located the various artists. Meanwhile Sandy works several days a week packing and shipping all of the newly paid orders. After I am finally happy with the story, the image of the art, and the quality of the art itself, it makes its way onto our website. It is a labor of love. I once did some math, and realized that for the time I spend, I am making the same as minimum wage in America. But in China, that puts me in "Upper Middle Class". That, and I am one of the few people that can say that I truly love my job!